Openig a double page I gessoed it with a fairly thin coat and when dry I used the DecoArt media acrylics through two Tim stencils. Although I picked this range out of the box I in fact only used six of them. 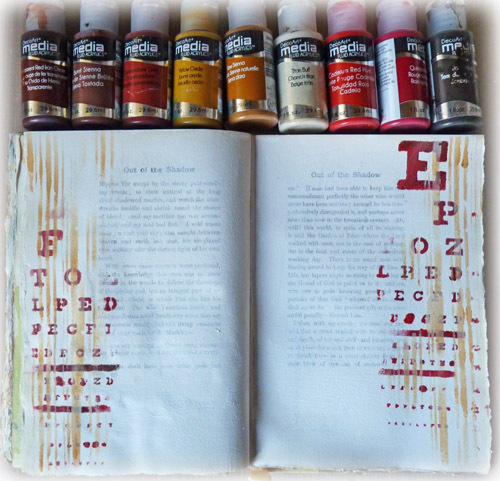 I added tissue tapes, stamping and chose some glimmer mists to create colour. Top Tip - when my glimmer mists are almost empty I add distress ink reinkers with perfect pearls to custom make my own colours similar to what was in the bottle. .... 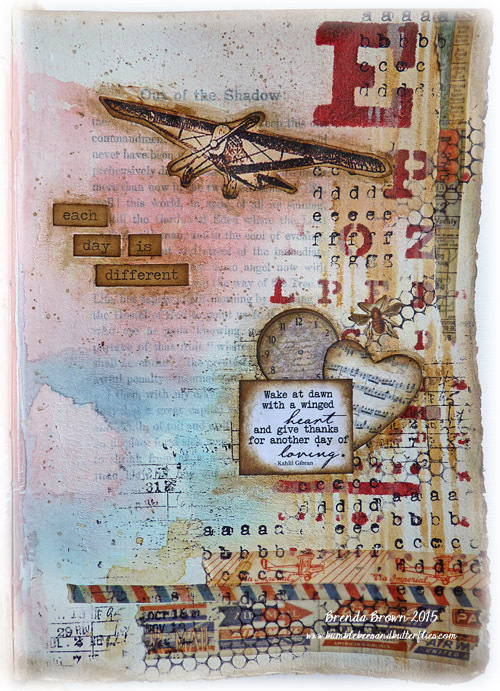 I added some on both pages and also found a little quote and chose some chit chat stickers to make up another. "Wake at dawn with a winged heart and give thanks for another day of loving." I am hoping it will stay dry on the Isle of Wight as we are going to the Rock Festival. Off early tomorrow morning to get the ferry and home the early hours of Monday morning. I am looking forward to seeing Fleetwood Mac, I have seen them in concert but I am sure they will be fabulous on an open air stage with all the lights. No camping for us we have booked a B&B so we will be able to have nice warm showers and a cooked breakfast every day. I hope you are having a great week and enjoy the weekend ahead - anything good planned? Take care - see you later this morning with a special post for today. Great spread Brenda, lovely steampunky feel to it all and a super quote!! OK, so now I am trying very hard not to be jealous, Fleetwood Mac, so many happy memories connected with listening to them many moons ago.... Hope you have the most fantastic time, here's for some sunshine and lots of fun, enjoy!!! My, what a fun page :-) and a fun weekend ahead too! Sunshine so out here so no playing in the craft department today....it's out in the garden for me & finishing off the pressure washing. Have fun on the IoW. I loved it even before you added the images Brenda - but what a difference they made! 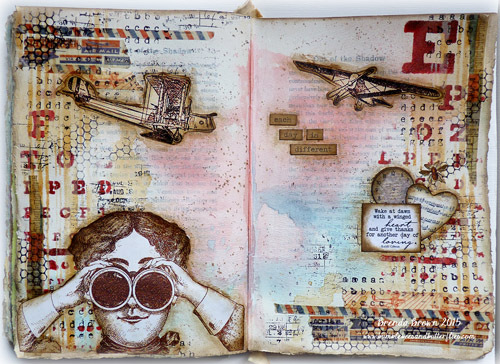 An absolutely stunning steampunk journal page. Another beautiful spread - love the tape and that funky gal peering out. Have a wonderful time at the festival! 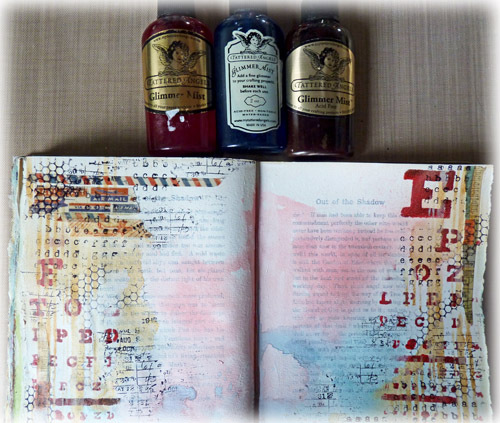 Fantastic journal pages, Brenda! Sounds like a wonderful weekend for you! Have fun! 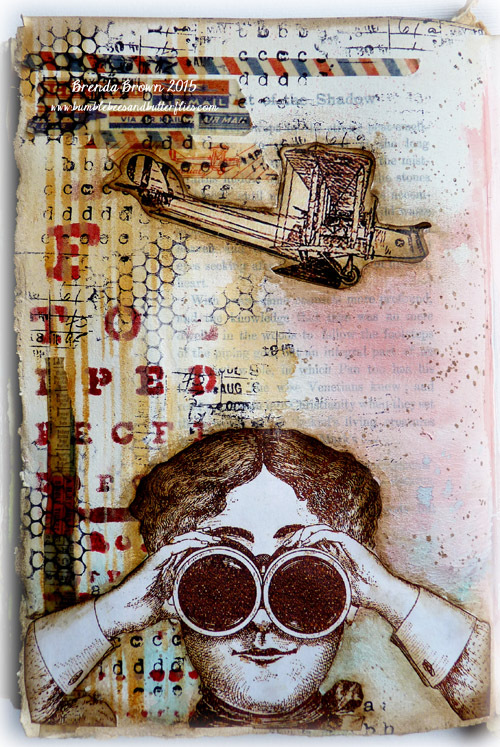 Wonderful journal page as always Brenda, love those steam punk images and what great quotes! Hope you have a wonderful time at the concert, what a treat to see Fleetwood Mac in person, rock on! Hope you're enjoying the weekend, judging by the pic on FB you are!! This journal page is fabulous.